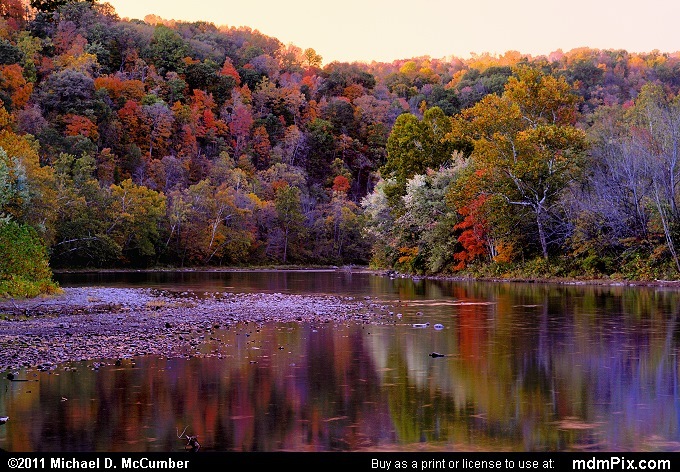 Photograph of fall foliage and some reflections in the waters of the Youghiogheny River during sunset at Cedar Creek Park in Westmoreland County of western Pennsylvania. The park has some scenic frontage along the Yough – as locals call the river and is popular for fishing and boating recreation. 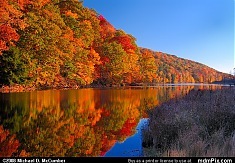 Picture was taken at sunset and pointing towards the light making the sky extremely bright compared to the Youghiogheny River Gorge featuring the fall color.